What could be more precious than treasured Christmas memories? 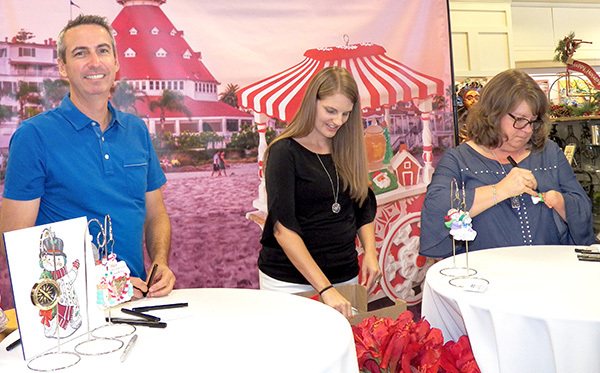 On Aug. 25, collectors of specialty Christmas keepsakes gathered at Elam’s Hallmark in Grossmont Center to meet two artist designers of collectible ornaments and grab up some of the precious Christmas treasures they create. Hallmark artists Tammy Haddix and Matt Johnson traveled from Hallmark’s corporate headquarters in Kansas City to sign the limited-edition keepsake ornament called “Santa’s Sweet Treat Cart.” Haddix and Johnson collaborated with other Hallmark Keepsake Studio artists in designing the ornament, which was available only at this signing event. Purchases were limited to one each until noon. Shoppers and collectors filled the La Mesa store, purchasing from the 300 ornaments created, as some tried their luck with tickets for silent auction raffle baskets on display outside the store. The collector hobbyists noted that they often partner their pastime with fundraising for local charities at special events like the Hallmark artists’ ornament signing that day. Proceeds from the ticket sales were slated for the San Diego Fisher House, providing lodging for families of military undergoing medical crises and being treated at the Navy Medical Center San Diego. Scott Elam, vice president of operations for Elam’s Hallmark, was pleased with the turnout, observing that the ornaments had nearly sold out by mid-afternoon. Members of the local Keepsake Ornament Club (KOC) were there in force. The group, which boasts more than 100 members, is named more specifically as Elam’s Magical Hallmark Memories Club. The club meets monthly and rotates fundraising to benefit the Women’s Resource Center in Oceanside and the Helen Woodward Animal Center in San Diego, in addition to the Fisher House Foundation. The Hallmark shop raises money on behalf of cystic fibrosis and Rady Children’s Hospital toy drives, as well. Another thing not often seen these days is a very successful, longtime family business. All of the Elam family members on hand during the afternoon agreed that Grossmont Center mall managers had delivered remarkable support for the event. (Father in the family, Guy Elam, attended morning hours of the event.) The Elam’s opened their first Hallmark store in Spring Valley during 1979, with operations since then growing to nine locations. Four Elam family members form the ownership group. The Grossmont Center store opened two years ago. Scott Elam elaborated: “The center has been phenomenal, adding to the marketing,” he said. Renee Micallef, president of Elam’s Magical Hallmark Memories Club, holds up two of her favorite keepsake Hallmark Christmas ornaments during ornament signing at Elam’s Hallmark in Grossmont Center. Another limited-edition companion ornament was available until noon, exclusively for KOC members. Titled “Sweet Sweet,” the KOC exclusive featured chef Santa Claus hoisting aloft a platter of cookies stacked like a Christmas tree in one hand, while holding a frosting-topped bundt cake in the other. The collectors mainly focus on keepsake Christmas ornaments, although some club members also have special events ornaments in their collections. 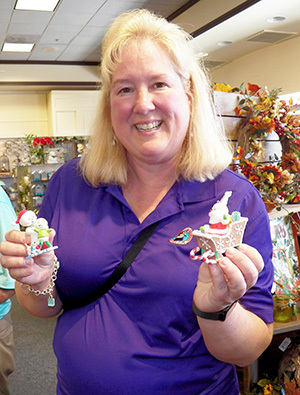 Club member Megan Casey-Jones said that each holiday season she creates a Christmas village from the ornaments in her collection. Collectors traveled from as far away as Phoenix, Arizona for the day. Chris Ryan arrived late, after four hours on the freeway driving from Yorba Linda. Ryan said that he has been a collector for more than 30 years, dating to the 1980s. His personal collection features motion series ornaments, window ornaments, and “Star Trek” and “Star Wars” collectible ornaments. More information about Elam’s Hallmark and the affiliated Keepsake Ornament Club can be found online at elamshallmark.com. —B.J. Coleman is a local freelance journalist and editor/staff reporter with 22nd District Legionnaire. B.J. can be reached at bjcjournalist@gmail.com.